That's the prediction of Anthony Seldon, head of Wellington College in Berkshire. Dr Seldon, one of the UK's most prominent head teachers, says that ambitious teenagers are looking further afield than ever before in their university choices. The level of interest is "rising sharply" this year, says commission director Lauren Welch. They were taken aback when 4,000 students turned up for a US university recruitment fair in London last month - double previous years. When admissions figures are known in the new year, she expects a spike in applications. The most recent figures, from this autumn's intake, saw big increases in applications from students in the UK to universities such as Harvard, Yale and the University of Pennsylvania. Students wanting to apply to US universities can take the SAT common entrance test in the UK - and the College Board which runs the test reported a 30% increase in such UK candidates. The introduction of higher tuition fees at UK universities, up to £9,000 per year, is pushing students to think much harder about their options. It's also changing the balance of what is affordable. Dr Seldon says that universities in the UK are going to have to take more care about what they're offering in terms of contact hours, subject options and pastoral care. The competition is now global. He says that for the price of UK fees, students are being offered courses in Hong Kong, with change for the air fares home. There are also pupils looking at universities in Canada, Australia, China, South Africa and in continental Europe, he says. The headline price of US universities can be dauntingly high - the top bracket are above $50,000 (£32,000) per year - but this is often offset by high levels of means-tested financial support. Harvard spokesman Jeff Neal says the university has seen growing numbers of students from the UK and that families with "low and middle incomes will likely pay no more to send their students to Harvard than to a UK university". From next year, students at Harvard from families earning below $65,000 (£41,000) per year will not have to pay any tuition fees. The most competitive US universities, hungry for the most talented students, recruit from around the world, with means-tested support available. So what's it like to go from a school in England to an Ivy League institution? 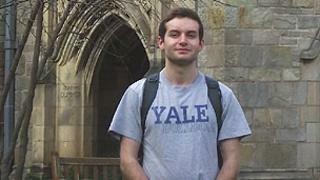 Jason Parisi, from Leighton Buzzard in Bedfordshire, has started this term at Yale and talks enthusiastically about his experiences. He says he was drawn by the quality of the course on offer, and the belief that the international experience would give him an advantage in the jobs market when he returned, marking him out from the rest of the graduates. The idea of an international education - gaining a more global perspective - appealed to him and he says that the "insular culture" which sees UK students stay at home is beginning to change. He is studying Mandarin, economics, English and physics. "There is nowhere in the UK where I could have had that combination. You can build your own education here," he says. Major US universities are extremely wealthy institutions - Yale's endowment rose to $19.4bn (£12.3bn) this year - and he says he was "very surprised by the amount of resources". Image caption Yale versus Harvard: Will the competition be for the brightest UK students? "Whatever you want to do, as long as you provide the motivation, you'll get the funding," he says. Perhaps more surprising is that the four years in Yale won't cost him anything, as the financial aid package is covering all his fees and costs, including travel. It's support worth about $250,000 (£158,000). It's not just the big beasts of US higher education which are finding themselves increasingly popular with UK students. Norman Renshaw, managing director of InTuition Scholarships, says his firm has been "inundated" with inquiries this year about applications for US universities, increasing threefold on last year. He connects would-be applicants with US universities offering academic and sports scholarships, representing about 100 institutions stretched between Michigan and Florida. The typical cost for students, after scholarships, is about £6,500 to £8,000 per year, he says. "Clearly tuition fees is the key driver, although I think the lack of availability of places at UK universities is also an underestimated factor," he says. There is a wider trend too, he suggests, related to anxiety about getting an advantage in the graduate jobs market. "It's becoming an international market. We're no longer just competing with each other. Employers are looking for people who have an international awareness." When ministers in London announced plans to encourage more competition in the university system, the expectation was that overseas institutions would set up in the UK. Instead it seems that students are heading in the opposite direction. It's not just US universities who are recruiting. Continental European universities are offering courses taught in English, with low or no tuition fees. Dutch universities, such as Utrecht, are touring schools in London and inviting applications. Maastricht has said it would like to become part of the Ucas admissions system. Highly-internationalised German universities are teaching courses in English to native English speakers, without charging such overseas students any tuition fees. Perhaps what has been odd before is that so few students from the UK had applied abroad. If numbers going to the US are now climbing upwards it's from a low base, because there has been remarkably little tradition of travelling abroad to study, particularly for state school pupils. For every 10 overseas students coming into the UK, only one UK student goes in the other direction. The most recent US figures showed 723,000 overseas students in its institutions, paying $21bn (£13.3bn) each year into the US economy. Almost half of these places were taken by students from three countries: China, India and South Korea, the rising education superpowers. Only about 1% of overseas students in the US were from the UK, fewer in number than from countries such as Nepal, Turkey and Saudi Arabia. A cluster of reports and organisations have warned against the dangers of such a stay-at-home tendency, when young people need to be able to navigate a globalised economy. A report from the Association of Graduate Recruiters and the Council for Industry and Higher Education, published last week, said that UK students were "lagging behind" in the skills needed by employers in a global economy. The report said major employers, operating across international borders, wanted competencies such as "global knowledge", "a global mindset" and "cultural agility". The British Council's Richard Everitt also backed an increase in students moving between the UK and US. "Increased mobility between students in both directions can only strengthen our current ties, and create mutual opportunities for greater prosperity," he said. The 1994 Group of research universities in the UK last week warned that internationalisation had to be a priority for higher education, including creating more overseas campuses. "Ensuring that UK universities have the support needed to thrive on the world stage is a key factor in driving growth, and should be at the heart of the government's economic strategy," said the group's chairman, Michael Farthing. Among the most high-profile pioneers of such a global strategy has been John Sexton, president of New York University. "Talent is found around the world and to ever greater degrees it flows around the world. That reality will radically re-shape US higher education in the years to come," he said.